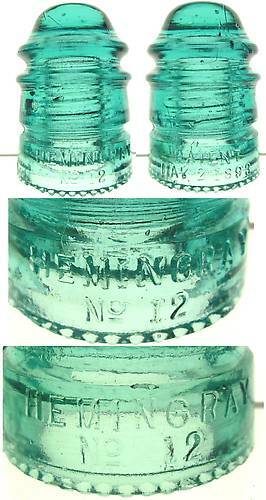 Reference Information - CD 113 Hemingray > Stamped & prism embossed No 12? Stamped & prism embossed No 12? I picked this one out because it appears to have both stamped and prismic embossing in the word HEMINGRAY. I have shown a typical stamped embossed HEMINGRAY at the very bottom. It appears that the MIN and possibly the G are prismic embossing with the rest of the embossing on both front and rear being the newer stamped. The letters MIN are definitely bold and angular. Opinions and thoughts please?